Oviedo residents Jon and Kate Randle could have spent their Saturday date night at a dinner and a movie, but instead participated in Do Good Date Night to help sort toys for Mayor Teresa Jacobs’ Holiday Heroes Toy Drive. Do Good Date Night is a charity alternative for those who want to volunteer and simultaneously have fun. Jon and Kate recently joined nineteen other couples at the Orange County Parks & Recreation warehouse on Orange Blossom Trail to organize and pack more than 500 toys for children in need in the area. Now in its fifth year, the toy drive, which was founded by Mayor Jacobs, annually collects more than 4,500 toys from Orange County’s employees and the community. Its beneficiaries include Orange County Neighborhood Centers for Families, the Community Food and Outreach Center, Orange County Public Schools, Wraparound Orange and Toys for Tots. The Do Good Date Night was established in the fall of this year by Orlando Date Night Guide Founder and Editor Kristen Manieri. 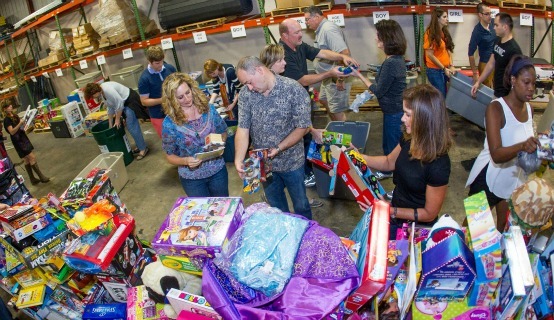 The monthly Central Florida event series mixes an hour of volunteering – like helping sort toys for needy Orange County families – with some delicious food and beverages and camaraderie with like-minded couples. Date goers at the Holiday Heroes event paid $15 and enjoyed food from Four Rivers Smokehouse and entertainment from local indie-acoustic band Beemo. Couples even donated an additional 65 toys to the effort. Other charities that have partnered with the Do Good Date Night includes Second Harvest Food Bank of Central Florida, Feeding Children Everywhere and Goodwill Industries. Mayor Teresa Jacobs’ Holiday Heroes Toy Drive is made possible by the countless hours donated by volunteers – like the couples at Do Good Date Night – and the generous support of partners, including WOFL Fox 35, McDonald’s of Central Florida, The Dr. Phillips Center for the Performing Arts, Canvs, City Year and Valencia College. The Holiday Heroes Toy Drive closes Dec. 14 and the need for toys is still great. To learn more about donating to the Holiday Heroes Toy Drive, visit www.ocfl.net/holidayheroes. For upcoming Do Good Date Nights, visit DoGoodDateNight.com. Photos from the Do Good Date Night may be found on Flickr for use by the media.